Meet the family of the week over at Give1Save1. They are adopting from Uganda. They have a beautiful video over there explaining their journey of adoption and how their relationship with Christ has grown because of it. Every Monday I’m going to ask you for a dollar. I’m going to tell you who it’s going to and what it’s being used for. We’re mostly funding adoption for the people, by the people. We’re just going to rain down a crazy blessing on a family, organization, orphanage, or project and we’re going to do it every week. And your dollar will be saving and restoring lives in all kinds of ways. Removing a child from an orphanage gives that child a family and a future, something everyone needs. It also frees up a bed in an orphanage for another orphan. Your dollar will change lives and save lives in ways you may never know. USCIS approval. Check. One step closer! After-Christmas clearance. Cabbage Patch Kid (memories from my 1980's childhood come flooding back!). And look at that -- beautiful Ethiopian skin color too! This is the first time I have bought anything for our future daughter. And it felt great. Things are finally progressing. Next up: dossier state certified, then to Ethiopia! Carrie G & Mandy G will each be in touch with Bethany Kerr Fine Art to get a free custom pencil portrait! Congrats! Thank you everyone for your support, donations, and sharing our link. And a big thank you to Bethany Kerr for donating her talents to help our adoption in this way! Check out her Facebook page and keep her in mind for some beautiful portraits in the future. One more day to enter your name in our drawing by donating $5 toward our adoption! Drawing will take place on Saturday, with winners announced back here on Monday. What will you win? Check out the details on Monday's post or Tuesday's shorter version. And yes, the Duggars have some custom pencil portraits from Bethany Kerr Fine Art, too. Please consider sharing this post! The more the merrier! please share this post... 2 days left! Okay, so we just have 2 days left before 2 lucky winners get custom pencil portraits from Bethany Kerr Fine Art! This prize is probably worth at least $100 dollars, and you could win by donating just $5 toward our adoption! Two winners will be randomly chosen on Saturday at noon. Here are the details: short version & detailed version. Please share this post and help spread the word! And thanks to those who have given so far -- we so appreciate your generosity! For the detailed post on our raffle this week, visit yesterday's post. For those of you who don't have time to read all of it, here's the short and sweet version. Donate to our adoption using the paypal button at the top of this blog. Then leave a comment letting us know how many entries you need. Every $5 donation = one entry into the raffle. There will be two winners of a custom pencil portrait! The raffle will close on Saturday, January 19th, at noon. We will post the winner on Monday, the 21st, so check back here to see if you're a winner! If you donated yesterday, we thank you! Even if you didn't leave a comment, we have your names in the line-up! The last document that needs to be secured before our dossier can be sent to Ethiopia for a referral is the I-600A. This is basically how the US government identifies prospective parents as qualified to continue in the adoption process. Our appointment is a few days away, and we were excited to see that we got an appointment so quickly! Other than finishing up our paper chase, we are now in the part of the journey where we can qualify for grants, since we have an approved home study. Since Christmas, we have sent several grant applications out, and we will let you know if we hear any good news from them! But this blog post is about another provision from God. He just keeps amazing us! God dropped a wonderful fundraising opportunity in our laps just before Christmas. A like-minded friend on Facebook offered to supply a beautiful pencil portrait for a raffle to support our adoption! Doesn't she do beautiful work?? Bethany Kerr is a mom of 5, soon to be 6! She is a passionate pro-life voice. Bethany has also written a book about her miscarriage experience that I recommend to all who have gone through that, or need information to help others. Bethany has an amazing talent and has offered to donate a pencil portrait for our raffle to help us raise money for our adoption expenses! If you keep up with the Duggars, you will even see the portraits of all their kids that she made for them! How cool is that? Yes, those are Bethany's handiwork in the background! Here's how it will work. 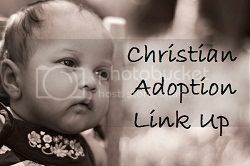 For each $5 donated toward our adoption, your name will be entered once in the raffle. We have a paypal donate button on the top of the blog. Donate there, then leave a comment below letting us know how many entries you need. Then, share, share, share this raffle with your friends and family! The more the better, obviously :) We will use a random generator to pick the winner, who will get such a wonderful heirloom keepsake portrait!! I wish I could win this prize! Just think of all the holidays coming up where you could gift a custom pencil portrait -- Mother's Day, Father's Day, or just because!! What about new baby, or in memory of a loved one? What about capturing multiple generations? I just love this one. She said that this was done using two separate photographs. So, if you want a pencil portrait of more than one person, but you don't have a good one of both of them, she can work from multiple photographs! Get the word out about this raffle... and if you'd like a chance to win an amazing custom pencil portrait, then ready, set.... go! Donate in $5 increments ($5=1 entry) via the paypal button on the top of this blog, then leave a comment with how many entries you need. The raffle will close on Saturday, January 19th, at noon. We will post the winner on Monday, the 21st, so check back here to see if you're a winner! We have an exciting opportunity for you to help with our adoption AND get an awesome prize in the process! Check back on Monday for the details... But just to whet your appetite, here's a sneak peek.